New York Australian Cattle Dog Rescue View other Australian Cattle Dogs for adoption. THIS IS A COURTESY POSTING. OHIO CATTLE DOG RESCUE TEAM DOES NOT HAVE THIS DOG IN THEIR POSSESSION NOR ARE THEY RESPONSIBLE FOR THE ADOPTION OR ANY CLAIMS MADE CONCERNING THIS DOG. ALL INQUIRIES NEED TO BE MADE TO THE POINT OF CONTACT IN THE BIO. This is one way OCDRT is able to assist when we are full. OCDRT has verified this dog is fully vetted, & the current owner will do a phone interview, check references, do a home visit, and require an adoption fee. 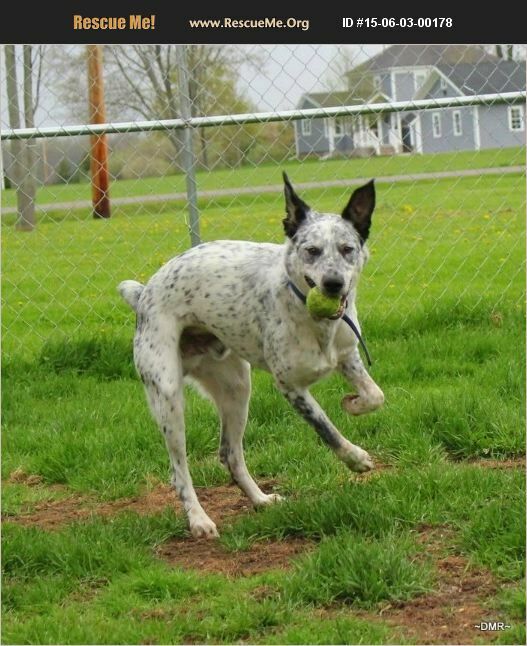 ABOUT BLU - COURTESY POST - NEWFANE, NEW YORK Please contact Don at cattle_dog@live.com Blu is a deaf 5 year old neutered male, Australian Cattle Dog / Border Collie mix. He needs to be in a household with no small children as he can be startled by them. Dog savvy children, 13 or older may be alright. Blu does best as a solo dog at this time. Hand signals are helpful with Blu and he knows them well. Blu is very energetic & agile. He walks good on a leash & would make an excellent jogging & hiking partner. He is learning to fetch and loves to play tug-of-war with a rope. Blu is crate trained, fully vetted and neutered. He has done well with an electronic fence & is good with cats & farm animals, even chickens!